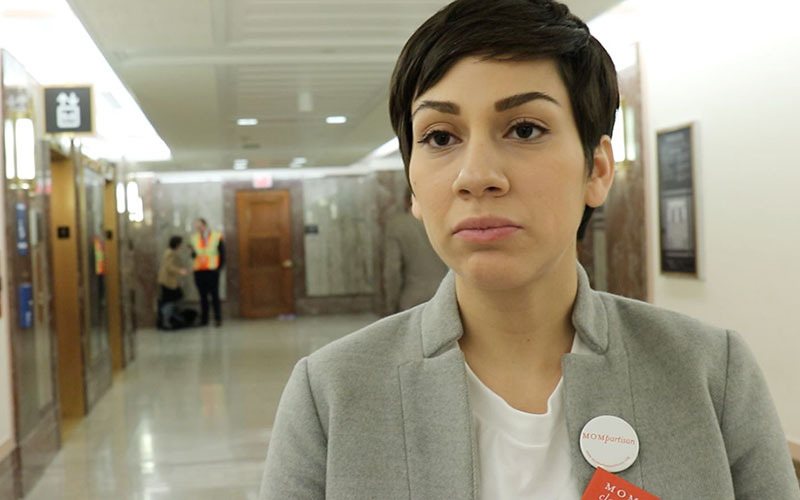 WASHINGTON – When environmental activist Columba Sainz found out she was pregnant for the third time, she knew to stay away from foods contaminated by mercury for the health of her baby. That’s why the Phoenix mother of two found herself sitting in a Senate hearing room in Washington on Wednesday with dozens of other activists protesting Andrew Wheeler’s nomination as the next head of the Environmental Protection Agency. She worries that a Wheeler administration will loosen restrictions on mercury emissions, among other changes. “I am really concerned that we do have a correct administration and I don’t think Andrew Wheeler is the correct one because he has been a former lobbyist for the coal industry,” said Sainz, the organizer for Moms Clean Air Force Arizona. 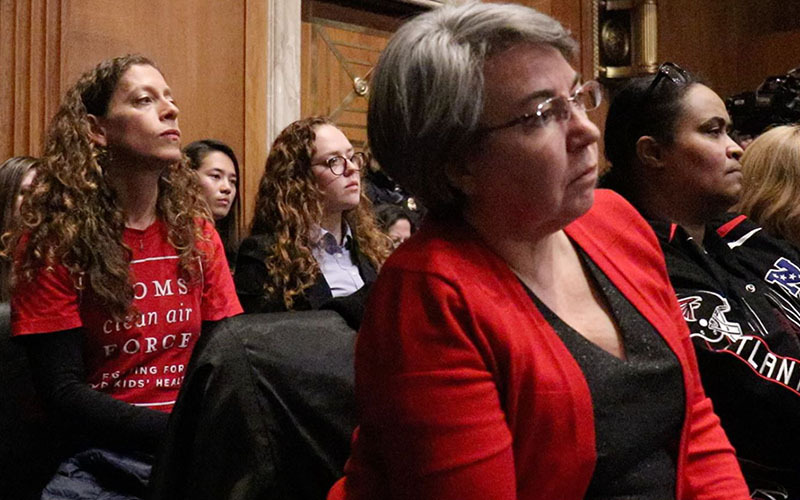 Moms Clean Air Force members and their families from across the country showed up at the hearing, wearing red T-shirts and buttons as they sat behind Wheeler, who was testifying to the Senate Energy and Natural Resources Committee. The moms and other critics oppose Wheeler because of what they call his close ties to industries he would be called on to regulate. They noted his previous work as a lobbyist for coal and chemical companies. That background was the subject of sharp attacks from Democrats last year when Wheeler was up for confirmation as deputy administrator, the No. 2 position at the agency. He was ultimately approved on a 53-45 vote, with three Democrats crossing the aisle to support him. One of those Democrats was Sen. Joe Manchin of West Virginia, who now sits as ranking member of the Energy and Natural Resources Committee. This is not Wheeler’s first time at the EPA. He worked in the Office of Pollution Prevention and Toxics for four years under President George H.W. Bush. President Donald Trump nominated Wheeler last year to replace Scott Pruitt, who resigned amid ethics investigations. Even some Democrats welcomed Wheeler as a calmer hand, but they noted he shares Trump and Pruitt’s zeal for deregulation. That brought praise at Wednesday’s hearing from Sen. Kevin Cramer, R-N.D., who pointed to Wheeler’s support for allowing year-round use of E15 ethanol fuel, which opponents say contributes to smog. As acting administrator, Wheeler has pushed through a rollback of the Obama adminstration’s Waters of the United States rule, which had greatly expanded EPA regulation of waterways. He supports dialing back fuel-efficiency standards for cars and in December proposed new rules that would relax limits on mercury emissions by coal-fired power plants. It’s just those types of moves that concern opponents. Heather McTeer Toney, former regional administrator of the EPA’s Southeast region, does not think Wheeler is qualified for the job. “For someone who wants to be the top person to protect our environment, he has no urgency. No urgency that the impacts and the positions that are made today will impact our children within the next 12 years,” Toney said. She pointed to his admission in November that he did not read the National Climate Assessment. “These are the type of issues that mothers are reading and urging their elected officials to act upon,” Toney said. Issues that motivated Sainz to come to Washington. Sainz says Wheeler’s positions on climate change and pollution are too in line with corporate interests to make him a good candidate.